Well, the FOMC meeting yesterday turned out to be a complete dud. In keeping with the spirit of the recent St. Patrick's Day holiday, Bernanke simply reaffirmed that the green wine of liquidity would continue to flow unimpeded by the possible cork of inflation, and apparently gave no thought to the severe hangover which will be experienced when the country wakes up in a strange place, with a "QE" tattoo, and buried under mountains of debt. The message of the press conference seemed to be that the Fed will keep printing gobs of money until either the unemployment rate reaches 6.5%, or until the earth crashes into the sun, whichever comes first (I'm taking bets!). Long-term, I remain bullish for the time being. Intermediate-term, I believe we have reached (or have nearly reached) a turning point. 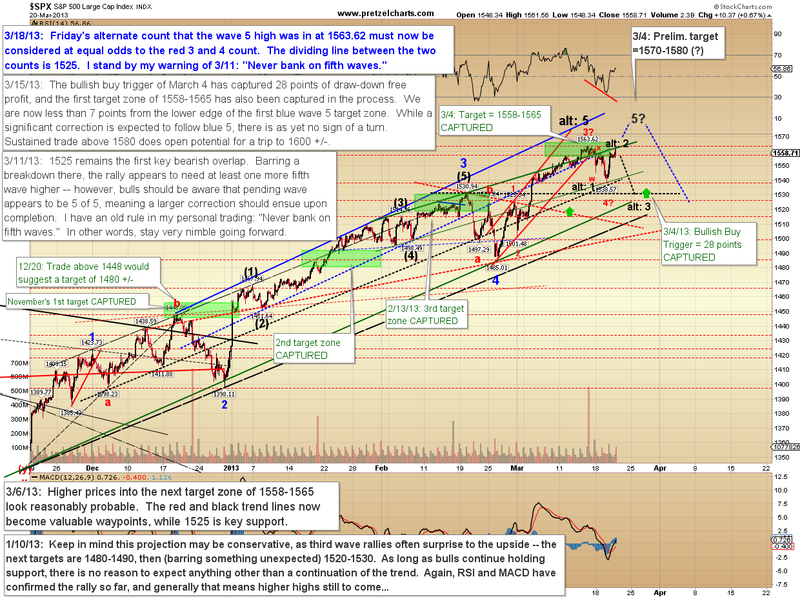 Short-term, I am slightly favoring a bearish resolution to the current wave. I should note that the trend itself, at all degrees, is presently pointed upwards. One law of physics that the market usually seems to obey fairly well is the law of inertia -- so, all things being equal, the odds are always slightly against us when we're betting against the prevailing trend. We'll cover the short-term first, and then move on to the intermediate term. The S&P 500 (SPX) performed largely as anticipated yesterday, and has continued to leave all near-term options on the table. It did exceed the 1559 level I expected, while at the same time it failed to reclaim the prior 1563 swing high, which leaves the more bearish near-term count wholly viable. While I can't say exactly what the market will do next in this position, I have listed a few signals to watch, and what their likely resolutions would be, on the chart below. Near-term, I remain slightly in favor of the bear count shown above, partially because of the pattern in the E-mini S&P futures, shown below. This pattern looks like an impulsive decline off the 3/15 high, followed by an ABC rally. If this pattern is not an ABC, then it is a very bullish nest of first and second waves, which projects significantly higher. I have trouble seeing the market sustain a rally that strong from this position -- and though stranger things have happened, I believe this lends credence to the near-term bear thesis on the chart above. On the 10-minute chart below, I have simply extended the existing trend lines and added a few new ones. Moving on to the intermediate time frames, the first chart I'd like to share comes from Sentimentrader.com, and shows the sentiment from the Investor's Intelligence survey -- bears are shown as a percentage in inverse scale. We can see that bears are becoming pretty scarce out there, and have reached their lowest levels in more than a year. While these types of things can never be used for exact timing of reversals, this does offer supporting evidence of the thesis that the current bullish wave may be nearing a correction. 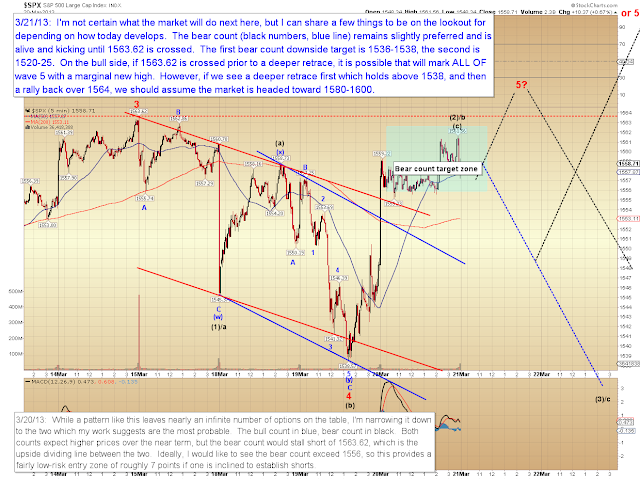 Looking at the hourly SPX chart, the counts remain unchanged and the question remains the same. It is still anticipated that a larger correction is close, but as noted, there is no confirmation of this yet and all of the major trend lines are still intact. In conclusion, although the Fed meeting provided none of the fireworks I suspected it might, the market still appears to be in the final stages of wrapping up a complete five-wave rally, which means we should remain on alert for a trend change. 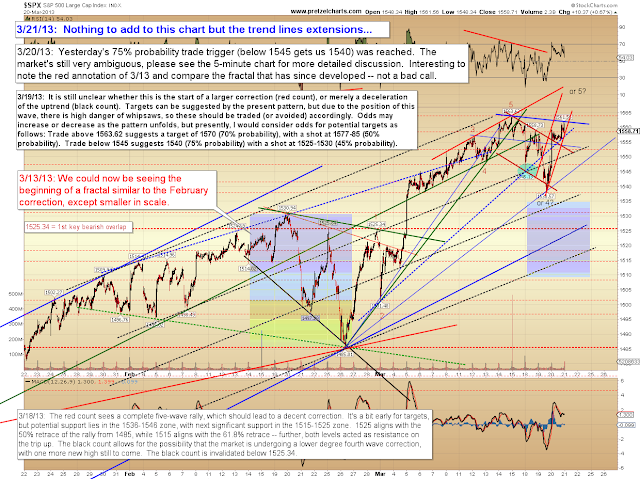 The first chart covers some of the near-term signals to watch to help us determine exactly where the tipping point may be. Trade safe. 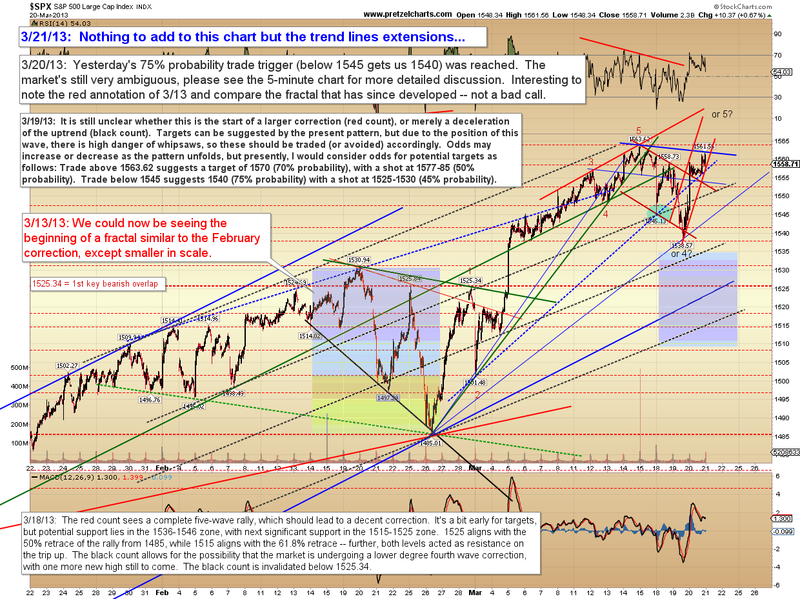 Wonder if this weeks pullback was the correction everyone was waiting for? I know it wasn't much of a pullback but it certainly bounced back nicely from the 1538 level.. This 1550 zone reminds me of the 1525 zone that we were at not too long ago. Maybe the QE zombies just need some R&R before continuing their buying spree?